No to public participation in planning? The Jezreel Valley in northern Israel is not what it used to be. Once hailed by Israel’s national composer, Natan Alterman, for its glorious beauty, agricultural fields, and its peace and solitude, is today in the midst of unprecedented development, with roads and rail lines checkering the valley and industrial zones and residential neighborhoods sprawling across the basin floor. In the Arava, where residents report that their landscape and open spaces are precious to them, rail lines, mining, water conduits and airports are all in the planning and implementation stages. In the Sharon region, 90% of the residents report that they want to preserve the rural character of their communities, and are fighting to prevent natural gas infrastructure from dominating their coastline. And the residents of the densely populated Tel Aviv metropolis clog the roads north and south every weekend to seek relaxation and a glimpse of nature in Israel’s last open spaces. This temporary migration reaches a crescendo on every national holiday when the police and land management agencies plead to the public to stop coming to the national parks and forests, as they are already filled beyond capacity. Israel’s growing population and shrinking open spaces warrant a professional and multi-talented planning authority that can reconcile competing needs and desires of the population in the short and long term. If sustainability – social and economic development coupled with the maintenance of the ecological systems on which we depend – is our goal, then public participation in the planning process is one of the most crucial ingredients. As revealed in a recently completed systematic review of sustainability projects around the world, a common theme throughout all the projects is public participation and transparency. In Israel, our history is not bad in that regard. Our robust planning system has multiple layers of opportunities for the public to be engaged in the process, including the opportunity to submit opinions, public hearings, transparent protocols, engagement of planning professionals, and inclusion of public representatives in planning bodies. Even with these tools, the challenges for assuring long-term sustainability and the preservation of our ecological resources is immense. Yet Interior Ministry Gidon Sa’ar and Binat Schwartz, head of the ministry’s planning authority, want to dismantle one of the key elements of our planning system’s sustainable strategy. In a cynical spin on the popular protest against rising housing prices, Schwartz, in a recent editorial in the Marker, blames the current situation on environmental organizations and their representatives in planning bodies. Under the false claim that there is not enough land for residential development, they want to purge planning bodies of anyone they deem stands in their way from quickly designating land for development wherever they see fit. Their current “reform” is culling public representatives from planning bodies, starting with the Subcommittee on Principle Planning Matters. That task of that subcommittee with the clunky name is to advise the National Planning Council on issue that the Council requests, including issues concerning national and regional outline plans, public appeals, deviations and more. A recent meeting of that subcommittee in March dealt with residential expansion of a moshav, road infrastructure, development of agricultural land, proposed deviations from statutory outline plans, illegal construction, sewage infrastructure and more. All of these topics are directly relevant to public health, open space preservation, ecological integrity, and social and economic equity. They are not simple technical conversations. The subcommittee included, until recently, a host of government appointees, in addition to representatives of the environmental movement, settlement institutions (the Jewish Agency and others), future generations, and professional guilds (planners, architects and civil engineers). These non-governmental representatives have been dismissed as part of the Saar-Schwartz “reform”. This was a step in the wrong direction. In the shadow of the Holyland fiasco and the exposure of insidious economic interests within the planning system, what we need is more, not less, public input and transparency. To justify tossing the public representatives from planning bodies, Schwartz paints herself and Israel’s citizens as victims of an all-powerful environmental lobby. She blames the emigration of young Israelis and their lack of hope on the environmental movement, preventing her from building apartments. In truth, the environmental movement had a single representative on her 18-member committee – enough to serve as a watchdog, but not to bottleneck the system. Schwartz, on the other hand, is both powerful (chosen by Haaretz as one of 100 most influential people in Israel) and has used her various influential posts to support development over local and environmental concerns and to find ways to push development quickly through the planning system. More importantly, as my colleague, Professor Amnon Frenkel, argued in the pages of Y-Net, the housing crisis is symptomatic of a far greater crisis penetrating Israeli society: income inequality, lack of social welfare, poverty and exploitation of workers. Those problems won’t be solved by rapid expansion of the housing stock. 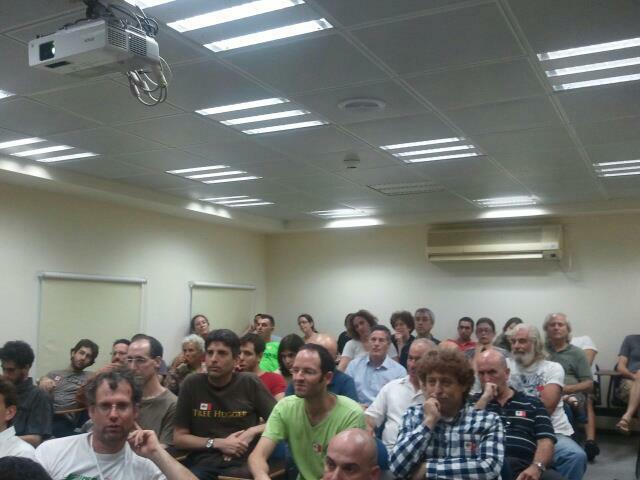 Tonight, 18 October, the Green Movement held its first activist meeting in Tel Aviv. Check in at this site, join the Green Movement facebook site, or check in at the main party site to see how you can help. More soon. Last month protesters from OWS along with community organizers broke into a home in East New York that had stood empty since being foreclosed in 2008 and turned it over to a woman and her family who had been homeless for the last 10 years. 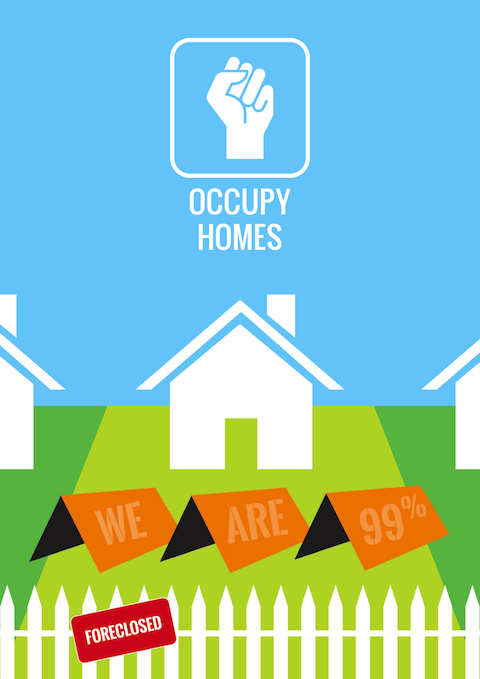 In similar actions in Columbus, Atlanta, San Francisco and Southgate, foreclosed, empty houses are being occupied by Occupy and turned over to those without homes. Evictions, sometimes as soon as 2 months after failing to make a mortgage payment, are being resisted by large crowds making it impossible for police to force people out of their homes. Through this action, OWS is putting its money where its mouth is by highlighting poor communities and how they have been affected by our economic system. It is also exposing some of the central questions we should be considering if we want to rethink how we run our societies. In order for the movement to grow the coming year it is essential that it proves its relevance in helping to solve problems. The true relevance of OWS in starting a new conversation on how we want to see the future of our societies can only be maintained by not restricting ourselves to pointing out what is wrong but by proposing alternatives and implementing them where possible. Only by testing our ideas can we ascertain if they work. We have nothing to fear from the messy process of trial and error. The focus on repossessed homes exposes one of the central differences between capitalism and socialism, between private property and community property, between the right of the individual and the right of the community. The question is what is of greater value, the right of an individual to buy an apartment building and leave it empty, for whatever reason, or the right of 20 families to housing at the expense of the individual? A city belongs to all its inhabitants. When you buy a plot of land in a city that has been zoned for dwellings, do you have the right to not develop that land? The permits and deeds give you the right to make a profit from developing an apartment building that will serve a number of families, it does not give you a right to not build that building. Finding the correct balance between the rights of individuals as opposed to the rights of a collectives is tough. Within reason, there is much to be said for the concept of private property. It is not difficult to find examples where the tyranny of the masses, or those claiming to speak for the masses, has trampled the rights of individuals. That this can and does happen in collectivist societies should not be used as an excuse to prevent criticism of the opposite extreme. We are witnessing a tyranny by individuals who have amassed enough wealth and political power to trample the rights and interest of the many in order to serve the privileged few. Besides highlighting these perversions, we need to make sure we spend enough time thinking about how we break these power structures without merely replacing them with equally unbalanced and perverse structures and then to act. The housing crisis, at the heart of the current economic meltdown, is the perfect testing ground to try and rethink the balance between these rights in very practical terms. We take our democracy for granted as much as those in power take their privileges for granted. One of the greatest achievements of the protest movement sweeping the world is that it is exposing the lies and half truths peddled by the power elites and our willingness to lap it all up. It reminds us that rights are never given, but taken. It reminds them that they rule by our assent, which will eventually be rescinded when that privilege is abused. It exposes the lengths that they will go to hold on to power and the means by which they hope to achieve this. Mitt Romney describes Occupy Wall Street as class warfare. He is not wrong, just that it isn’t the recent protest that started the conflict. It started with Ronald Reagan’s 1981 campaign to destroy organized labor, with further shots being fired by partner Margaret Thatcher during the coal miners’ strike of 1984-85. All of this being just the start of a campaign by conservatives, neo-liberals, free-marketeers and corporate interests to bring back the Gilded Age and the Roaring 20’s. This campaign has been going on for a very long time, with much success. While we have been busy shopping, expressing ourselves with Nikes, Diesel jeans, gold and platinum credit cards, the right usurped the left. It was on Bill Clinton’s watch that Glass-Steagall was repealed. It was Tony Blair, with his New Labour, who implemented privatization that Thatcher could only have dreamed of. Most of the rest of the developed world followed suit, with the IMF and WTO often encouraging similar moves to free market capitalism amongst those developing nations that came to seek relief. With the cooption of the entire political machine now exposed, it becomes clear that our Democracy has devolved into little more than a farce. We snicker at despots that claim to receive 98.76% of the popular vote in what they call democratic elections. At the same time we freely choose between candidates that all essentially implement the same policy. Where is the Democracy in that? Each time the establishment lashes out, whether in New York, California, Egypt or Tel Aviv it assists in more clearly contrasting the choices we are faced with. It is this conflict that is exposing what is at stake. It is the disobedience of the governed and the establishment’s reaction that is making the scam so blatantly clear. Is it a coincidence that Mayor Bloomberg held a news conference to reveal a foiled terror plot that had been under control for two years, complete with a video of what the plot’s success would have looked like, only days after realizing that he was loosing the public relations battle? Was there no connection between the incessant chatter about the Iranian threat by the Israeli government over the last couple of weeks and the passing of new anti-libel laws, laws against financing of NGO’s, laws on giving politicians more control over the selection of Supreme court justices? What emboldens those in power to continue using excessive force to deal with these annoying protests is the knowledge the majority will look at these transgressions and believe that they will never be perpetrated against them. But they always are. What starts with Jews will end with anyone opposing the regime, by way of Homosexuals, Communists and Gypsies. What starts with Muslims will end with privileged white college kids speaking in opposition to the establishment by way of Arabs, Mexicans and the unemployed. As Matt Taibbi so aptly puts it, what is hardest is the transgressing against the first liberty, trampling the rest becomes increasingly easy. Armed with this knowledge, that we are next; that if we are not now unemployed to allow for greater profitability, we soon may be; that if we are not nowbeing poisoned by yet more exploitation of our natural resources, we soon will be; that when we sympathize with others that have had their freedom curtailed, we know ours are soon to follow. How can we continue to sit at home and wait for someone else to bring change.? Get you down to Zuccotti Park, to Tahrir, to Rothchild boulevard and put your body on the line before they have your soul. Our whole perception of what corporations mean is steeped in clichés and misconceptions. “The business of America is business,” as attributed to Calvin Coolidge was never uttered by him. More than anything, the last 30 years has been about telling stories about the place of corporations in our lives and our society. Business leaders have become celebrities, from Jack Welch to Donald Trump, celebrated for their contribution to society, for their ability to get things done, for making tough decisions. It is the very nature of corporations and those that lead them, specifically publicly traded companies, that has led us to the precipice. Find any period in history where the accumulation of wealth is celebrated above all else, where businesses provide the role models for harnessing human ambition and social upheaval soon follows. So what is it about modern business theories and the way that companies are run that is tearing our societies apart? Here are some of my thoughts. Companies are run for profit. If doing good makes a profit, that’s great. If doing bad makes more, even better. It is only the negative impact of getting caught breaking the law or performing immoral acts that keeps corporations from doing so and even then only on condition that penalties and negative press have a greater detrimental effect than the potential profit. Business ethics exist because they are good for business not for ethics. It is the fiduciary duty of a company’s management towards the shareholders to maximize the return on their investment. It has been the preoccupation of business theorists during the last couple of decades with this duty that have made this the central tenet of modern management theory. Keeping in mind what is best for the workers, the community or even the company itself has become secondary in comparison to this article of faith. Despite mantras aired to the contrary by marketing firms the world over on behalf of their corporate masters, the shareholders in public companies are the only real customers, not those individuals purchasing its products and services. More and more often companies live entirely from quarter to quarter where no real investment in the long term is made out of fear of showing a short term dip in profitability. There exists a tyranny of profitability. The way modern executive compensation has changed is meant to ensure that this tyranny perseveres. Less and less compensation is the result of work done and paid through a salary while more and more it is the result of profitability delivered as expressed in stock price which is compensated for by options in those same stocks. As there is a whole set of laws and regulations in place that ensure that the behavior of corporations is viewed as a-moral; that they are not to be judged for their behavior because they are not people (except for in the case when corporations want to influence elections when they can be considered persons as per the US supreme court according to the people vs. citizens united); that we have come to expect executives to think only of the good of his shareholders and that we celebrate those CEOs that are best at this by turning them into celebrities and social icons, we can not expect corporations to do what is good. Companies will, if allowed to, outsource labor to the lowest bidder, even if that means using child slavery. Corporations will destroy any natural resources that will guarantee a buck. Even self preservation will not prevent them from long term self destruction, because the danger is just too many fiscal quarters away. It has not always been this way. With the proper regulation businesses have been good partners in society. It is essential however to determine ahead of time what the limits are of corporate freedom in its pursuit of profitability. It is the headlong race to remove regulation during the last three decades that has led to the excess which allowed the 2008 financial crisis and which still allows Wall Street and Big business to post record profits while the world is in the midst of a serious recession and many countries, including the US, struggle under crushing levels of unemployment. It is not uncommon to hear someone say, when faced by the incompetence and narrow mindedness of politicians, that what we need is more people from the business world as political leaders. Businessmen are result oriented and know how to get things done, the demagoguery goes. But is it not the fact that we have turned the business world into our role model that has made our politicians incapable of long term planning? Isn’t it because we have come to accept that our representatives talk to us in 30 second or less sound bites, commercials really, that none of them come up with anything particularly smart or sophisticated. Perhaps it is because the lobbyist are the most consistent in demanding results on a day to day basis, polling the stock exchange of political influence regularly, that has resulted in politicians across the spectrum dancing to their tune. We should not wish for businessmen to save our politics, they are already busy running it into the ground. It is not businessmen that are missing in our politics but rather politicians. The business of government is to ensure the well-being of the governed, not make a profit. We need politicians that can resist the siren call of special interests, that are able to articulate and execute long term planning, who have conviction in their ideas and are busy pursuing them instead of obsessing about their electability. It is only when politicians are judged on the positions they take and the plans they propose rather than what they avoided saying or supporting that we will have real choices between the different ways of running our country rather than choices between different faces ruining our country. A reoccurring theme at the Occupy Wall Street protests has been that it is the entire representative system that has been bought up by corporate America. Both parties have been proponents of deregulation, tax loop-holing, preferring the interests of the rich over the poor and consistently opposing environmental regulations that could impact big business. These policies are clearly the result of political influence wielded within both parties by lobbyists representing the 1%. It is not that the OWS movement is a-political but rather that they have come to the conclusion that there is no point in supporting anyone in either party as both fail miserably in representing the interests of the 99%, doing so consciously and willingly. Similarly, in Israel, none of the major parties represent interests wildly different from one another. Likud, Kadima, Avodah, Shas and Israel Beyteinu have all bought into the same neo-liberal fallacies. Besides each party pursuing their shallow sectarian agenda, they all willingly participate in the privatization-fest. No one has made any real effort to resist the big business lobbies, the real estate developers, the employment contractors. Opposition to all these policies has been popular for long but have not been pursued. The same empty rhetoric is rehashed every election cycle only to be abandoned even before the last ballot is counted. Each party hides behind their (slightly) different positions vis-à-vis the Palestinians whiles ignoring their responsibility to give its citizens a choice about how the country is run. It is with similar cynicism that we are cajoled into continuing the same voting patterns that have led us no-where by being told to vote for the lesser evil. “I know that (insert politician) isn’t great but if you don’t vote for her, (insert different politician) will get to power and that would make things even worse.” As Chris Hedges recently pointed out, “Our political class, and its courtiers on the airwaves, insists that if we refuse to comply, if we step outside of the Democratic Party, if we rebel, we will make things worse. This game of accepting the lesser evil enables the steady erosion of justice and corporate plundering.” The result is that nothing changes for the better. The same failed politicians stay in power and much more significantly, voters lose their belief in democracy as a means of fairly representing their concerns. It is this voter cynicism and apathy that is like a deadly cancer to Democracy. The less people feel invested in the democratic process, the less they participate, the less they vote , leaving the special interest groups to promote their selfish limited agendas while more and more people forget that they are part of a social group with shared responsibilities and a duty to look out for one another. It is this cynicism that allows us to forget that our society must reflect our values and when it does not , that that is a failure on our part. Claiming a lack of interest or participation does not absolve us of that responsibility. Voting should be a moral exercise and never a tactical one. More than anything else, what has caused me to vote for the Green Movement and become a dues paying member is that it comes closest to matching my world view. As I’ve said before, environmentalism is the new socialism. Not less importantly, it has strong, functioning democratic institutions. Neither the fact that the Green Movement was not elected to parliament during the last elections, nor the likelihood of it getting elected in the future should influence your support. Whomever you vote for, you should do so because you are voting for the ideas and policies represented by them and not against those of another. You should vote for those you identify with and not those you are familiar with and used to voting for. Voting should not be a knee-jerk reaction. You should vote for what you believe is good. Democracy should be a moral, ongoing exercise that allows us to live together despite our differences and not a zero sum game where one group gets ahead and the rest get punked. With each additional reporter bleating “but what are your demands? !” at the protesters at occupy Wall Street, I better understand the genius in not having demands. You only have to go down to Zucotti Park to realize that these people are not a homogenous group. From Anarchists to Pacifists, from Libertarians to Socialists, from Atheists to Christians, Jews, Muslims, Sikhs, Hindus and Buddhists, from the homeless to the privileged college students, from the professional lifetime protesters to the first time participants these people agree about very little except that the current system can not and must not continue lest it destroys us all. By not publishing a clear set of demands this movement is allowing the widest possible audience to feel included in it and represented by it. By not publishing a clear set of demands this movement is refusing to play by the rules of those in power, against whom they are protesting. It has pushed the 1% off balance and has them scared. Anyone that has been involved in any kind of protest over the last 10-15 years more likely than not has walked away disappointed. Rallies were held where stirring speeches were made. The written and electronic media, possibly sympathetic to the cause, gave some coverage. Leaders emerged who expressed the frustrations and demands of those upset enough to stop just sitting at home and complaining at the television. Those same leaders eventually fell in love with the attention and their access to power so that the political class easily absorbed and co-opted them while making minimal concessions. Soon enough the protests petered out, the working groups dispersed and everyone went home trying not to feel disappointed. The genius of not having a clear set of demands is that, in essence, it allows you to answer the question of “what do you want?” with “everything”. It is this answer, this all inclusiveness, which differentiates the current protests, whether they are in NYC, Tel Aviv, Barcelona, Athens or Cairo from what has come before. When what you are demanding is justice it is easy to gloss over the nuances of political differences or even significant differences in understanding of what justice is. When there is no clear leadership, there is no place for the usual jealousy or concerns about a small group making the wrong decisions for the majority. There is only a common understanding that the reign of the plutocratic minority must end, that their power over our politics and lives must be broken. It is the growing understanding by many that the current protest movements are the real deal, that with enough effort and dedication and perseverance real change can be effected that is causing people to forsake their cynicism. The kind of change people believed that the election of Obama would bring and left so many so bitterly disappointed. It is the task of these protests, of this movement, to effect change. The same people that will change the status quo will not necessarily be the ones the build the new reality. It is enough for now to say that the way things work at the moment can no longer continue without having to answer exactly what will take it’s place. It is the growing understanding by the plutocrats, the 1%, that what the protesters are demanding is everything that has got them scared. It is the realization that this might not be a passing fad that is causing more than a few sleepless nights. They are starting to realize that the rest of us have figured out their game and are refusing to play by their rules. As this becomes clearer to them, as the stark reality dawns on them that there is no way that they can both placate the crowds and maintain their current lifestyle, we can expect their resistance to become more concentrated and violent. As the violence in New York and Sydney and Oakland has shown so far, this will only work towards causing more and more people to feel included in this movement. Zazzle On-Line store for Green Movement-Meimad buttons, posters and more!